Macedonia (Greek: Μακεδονία) is a region in northern Greece. 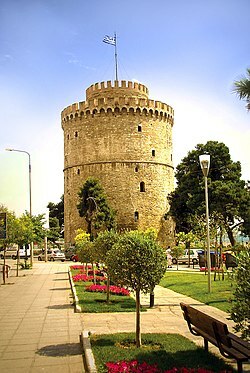 The White Tower of Thessaloniki; the city's landmark. Macedonia is the largest and second-most-populous Greek region, with a population of about 2.4 million of which alone 1 million live in Thessaloniki. The region is highly mountainous, with most major urban centres such as Thessaloniki and Kavala being concentrated on its southern coastline. Macedonia incorporates most of the territories of ancient Macedon, a kingdom ruled by the Argeads and whose most celebrated members were Alexander the Great and his father Philip II. Although it has very scenic areas and many very interesting cultural sites, it is visited by relatively few tourists, except the Chalkidiki and Olympos region. When speaking with Greeks about Macedonia it is better not to participate in any discussion or to agree that the name Macedonia is only Greek if you want to maintain a friendly atmosphere. Greeks are patriots and do not want any historical teachings on this sensitive topic. Although the name issue with the neighboring state of North Macedonia is now politically resolved, most Greeks still find it a betrayal of their history. This was reinforced by the creation of statues of Alexander the Great in Skopje and the use of symbols from Greek excavations by the neighboring state. Many Greeks wonder why the majority Slavic population of the neighboring state uses purely Greek symbols and national heroes for their nationality awareness. 40.6322.0699 Naousa — The modern city is situated few km west of the ancient town of Mieza, the seat of the ancient School of Aristotle. of Macedonia and the place where Alexander the Great was proclaimed king, short after Philip's assassination in 336 BC. 39.992622.623310 Platamonas — a sea-side resort town with an impressive 12th century Byzantine castle. 40.05722.56513 Leptokarya — Beach resort town. Located near ancient Livithra, allegedly the home of Orpheus, a legendary musician in Greek mythology. 40.17122.4854 Dion (Pieria) — An ancient city and sanctuary dedicated to Zeus. Philip II and Alexander the Great celebrated victories in Dion. 40.48822.3185 Vergina — The ancient Aigai, the first capital of Macedonia and the place where Alexander the Great was proclaimed king, short after Philip's assassination in 336 BC. 40.941721.9746 Megaplatanos — A rural village between the Pozar thermal baths (5 km) and the Voras ski resort (40 km). Greek is the official language of Greece and thus, the vast majority of the inhabitants of Macedonia speak it as their native language. English is spoken by many people, usually under the age of 40, and mostly in big cities like Thessaloniki or in tourist resorts, like Chalkidiki. Most visitors come to Greece to spend beach holidays. If you want to travel out of season, be aware that many resorts outside the season are in a kind of hibernation and only a few restaurants and shops have opened. Who wants to travel at this time should choose larger towns as destination, since here at least a basic tourist service is guaranteed. This region travel guide to Macedonia is an outline and may need more content. It has a template, but there is not enough information present. If there are Cities and Other destinations listed, they may not all be at usable status or there may not be a valid regional structure and a "Get in" section describing all of the typical ways to get here. Please plunge forward and help it grow! Discussion on defining regions for Macedonia (Greece) is underway. If you know the area, please share your opinion on the talk page. This travel guide page was last edited at 14:24, on 10 April 2019 by Wikivoyage user Traveler100. Based on work by Wikivoyage users Inferno986return, Traveler100bot, DocWoKav, Spekulatius2410, AndreeBot, Wrh2Bot, Gobbler, Handrian and Ypsilon and others.